Winning Wrestling Moves is a generously illustrated guide that shows wrestlers at the high school and college levels how to come out on top in every match. Mark Mysnyk was a two-time New York state high school champion, a member of four of the University of Iowa's NCAA championship teams, an alternate on the 1976 U.S. Olympic freestyle wrestling team, and a member of the 1977 World University team. His many years of wrestling and instructing wrestlers have provided him with rich insights, which he shares in describing the techniques in this book. Dr. Mysnyk is an orthopedic surgeon in Iowa City and an active as a volunteer wrestling coach with Cornell College in Mt. Vernon, Iowa. 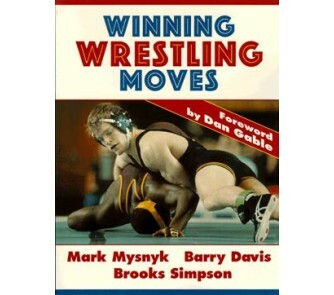 He is also the author of the highly successful book Wrestling Fundamentals and Techniques: The Iowa Hawkeyes' Way. Brooks Simpson is a champion wrestler at the national level as a Big Ten champion and NCAA runner-up in 1990. He has taught wrestling techniques at Dan Gable's Training Camp and other wrestling clinics since 1986. He is also the wrestling coach at Parkview High School in Springfield, Missouri. Barry Davis has experienced success at every level of wrestling. He is a three-time NCAA champion; four-time All American; three-time Iowa state champion; and a Pan Am, World, and Olympic medalist. He also has several years' experience coaching wrestling as Dan Gable's assistant at the University of Iowa and as an assistant under Andy Rein at the University of Wisconsin. Barry is the head wrestling coach at the University of Wisconsin. "This book contains easy-to-follow material for the beginning wrestler as well as enough detail to aid the seasoned coach and athlete. A great addition for the serious wrestler." "This is one of the most technically elaborate wrestling books I have ever read. The precise descriptions and accompanying photos will be of great benefit to all who want to increase their knowledge of wrestling. It covers all aspects of wrestling, from takedowns to pins."